I absolutely love incorporating modern and minimalist themes to enhance landscaping. Personally, it truly is my favorite choice for landscape design. I am attracted to the simplicity of lines, linear structure, neutral color pallet, innovative materials and focus on sculptural details. All of these aspects combine with simple shapes creating an elegant and charming design that is very appealing. Typically, the combination of grey, white, beige, brown, and black form the color pallet that serves as the foundation for modern gardens. These colors come together exceptionally, allowing other accents of colors and accessories to stand out against the background. Grass, plants, and pebbles also provide additional colors, enhancing your minimalist design. These little accents look beautiful against the neutral base found in your landscape design flooring and exterior walls. The result is awe-inspiring! I’ve put together a few tips to help you take your modern and minimalist landscape to the next level! A key trait of modern landscaping lies in creating clearly defined spaces. The geometry of modern garden is sleek, unique, and pristine. We’re not talking about a boring, and stuffy space, though. Keeping things interesting is essential! 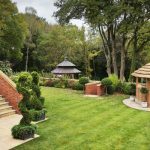 You can create a defined space using gravel or pebble to create rectangles to break up the lawn, creating a stunning stepping stone effect. Or you can create many distinct areas, using a pool, water features, or an abundance of simple flower beds to create fun and different areas in your backyard. When placed properly, the right combination of gravel, tile, water and lush plants will combine to form your perfectly planned modern landscape. Usually, a modern garden places more focus on the architecture and materials than on the plants and greenery. Landscape should always be designed keeping in mind the architecture style of your villa. When designing your landscape, be sure to use the style and theme of your home and then incorporate those ideas into your landscape. Remember that you will often be looking from the inside of your home to the outside. So it’s important to connect the color theme and styles so that your home effortlessly extends into your exterior landscape, creating a peaceful transition from one space to the other. A modern garden is typically characterized by a sleek, streamlined and sophisticated style. Modern garden designs also draw on the simplicity of minimalist Asian design practices. Usually, a modern garden places more focus on the architecture and materials than on the plants and greenery. Geometric shapes and repeating patterns are commonly incorporated in modern outdoor spaces. The main idea is to design a garden that has a managed and organized presentation. Modern designs use shade structures that are simple and functional. Whether they are concrete, white in color or shades of brown, they are always simple. Steer away from gazebos designed with thatched roofs and Mediterranean roof tiles. These ornate structures don’t mix well with a modern theme. Instead, keep your shade structures simple and sleek. Modern gardens often rely on structural accessories to achieve their minimalist look, with plants used as accents rather than focal points to provide contrast and color. Enhance your minimalist design with modern outdoor furniture crafted from natural elements such as wood, metal, wicker, concrete, and marble. Use weatherproof geometrically inspired cushions and pillows to further enhance your outdoor furniture. When creating a modern design, it’s important that your accessories incorporate innovative shapes for planters, modern sculptures, vertical gardens, and sleek benches. For an added touch, be sure to include modern and easy to maintain water features. Its contemporary linear form combined with the soothing sound of water can insert the culminating finish to your design. You can even get creative and make things on your own, adding a distinct personal touch to your modern landscape design. One of the most important aspects of creating a modern garden is creating a space that is clean and clutter free. Stick to the minimal use of furniture and accessories, allowing enough space to move around. Also, be sure to remember that plants are meant to be used sparingly. When you do incorporate plants, remember that repetition and groups of plants are crucial elements to modern style. Use plants that are simple and make a statement, like an Olive tree. Steer clear of unruly and wild plants; they simply don’t belong in this clean and sleek design. Modern minimalism is exactly that: minimalist! This is a style that focuses more on form, color, and abstract ideas. Remember that when it comes to modern themed gardens, less is always more. Their refined forms, pure materials and the achievement of balance distinguish the quintessential aspects of modern garden designs from all others landscape designs. I just know that you will love this style as much as I do!